Billy Ireland is the undisputed originator and king of the local-interest Sunday page (see his The Passing Show blogged here), but he was by no means the only practitioner of the craft. Here's a pretty faithful copy of the feature called The Big Parade. This page ran in the Arizona Republican (later shortened to the Arizona Republic when it became unfashionable for papers to wear their political leanings on their sleeve) from 1926 to 1948. Reg Manning conducted the Big Parade, and he was also the editorial cartoonist of the paper. Manning gained a certain amount of fame as the author of such Arizona-centric books as What Kinda Cactus Izzat? and The Cartoon Guide to Arizona. An interesting part of this feature was that a continuing storyline comic strip ran along the bottom for quite a few years. Titled The Rough Riter, it is humorous adventure in the vein of the Gumps. Allan, I somehow thought -- because of Ireland, I'm sure -- that these full pages were always particularly mid-western, so it was interesting to see Manning's contribution. 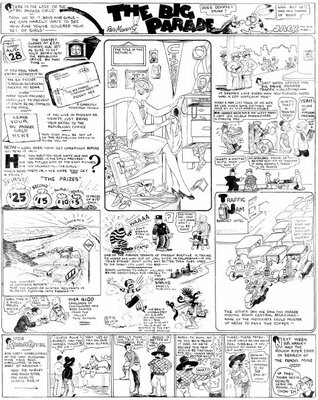 I don't know how your Ohio list reads, but other than Keys, there was Harry Westerman with "Cartoon Events" at the Ohio State Journal; Leland McClelland with "Cartoon Parade" at the Columbus Citizen (drawn til '59); "The Once Over" by O'Dell Dean, Dayton Daily News, ca. 1920s (and more?). Leo Egli also did one in Zanesville (OH), but at this moment can't find the clips for a title. And all these were editorial cartoonists, primarily, except for Dean, a staff artist who occasionally contributed to the editorial page. I don't have Westerman, but I think I have seen it - dim memory says that I felt it was too editorially oriented to qualify for SG listing. I do have The Cartoon Parade (37-59). Dean and Egli's I haven't seen. Another page from out west was the untitled one by Doc Bird Finch for the Denver Post. I have examples from the 20s and 30s, and I saw one on eBay supposedly from the teens as well. Here's the rarely seen Sunday version of that long skinny daily strip called Little Sport. The Sunday ran from 1950-56 in only a few papers, while the daily version flourished and ran 1948-1976. The daily version was a favorite with newspaper editors for the same reason that Peanuts was initially successful. The features were so darn small that they could be used to plug a hole here and there in the paper (yup, Peanuts was marketed as a throwaway filler, as sacreligious as that may sound now). John Henry Rouson, the creator of Little Sport, had a fascinating life and yet was also a real workhorse at the drawing board. He juggled three daily features (the other two are Boy And Girl and Ladies Day) with, apparently, little assistance. Regarding his fascinating life I'll have to demur on that story; too busy (or is it lazy) to pull out my files on the gent - some other time. Thanks for this; although our local paper, the Aberdeen Press and Journal ran Little Sport for years, there was no Sunday paper, so I never knew the Sunday version existed ’til now - come to that, I never found anyone else who remembered it! If you haven’t done so already, can we have the story of the author? I have updates today on some of the unanswered questions discussed in previous blog entries. First, the issue of the Chicago Chronicle 16-page color comics section of 1903. Alfredo Castelli first alerted me to its existence, and I reported my findings on these four posts (1 2 3 4) after reviewing the first batch of microfilm. A new batch of microfilm came in covering 5/17 - 12/9/1903 and I can now say that the section ended on September 27, 1903. 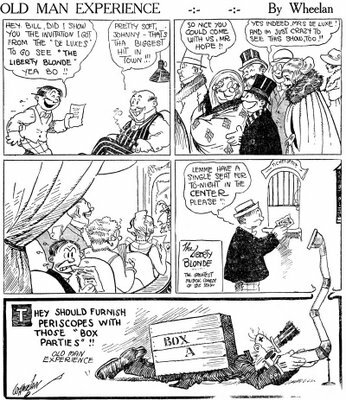 After this date the Sunday comics were limited to a black and white page of mostly panel cartoons. Once again, the microfilm is missing most of the Sunday comics sections. The only ones found were for 7/12, 7/19 and 7/26. In addition to the titles I reported on earlier, these sections allowed me to identify a new batch of continuing titles. 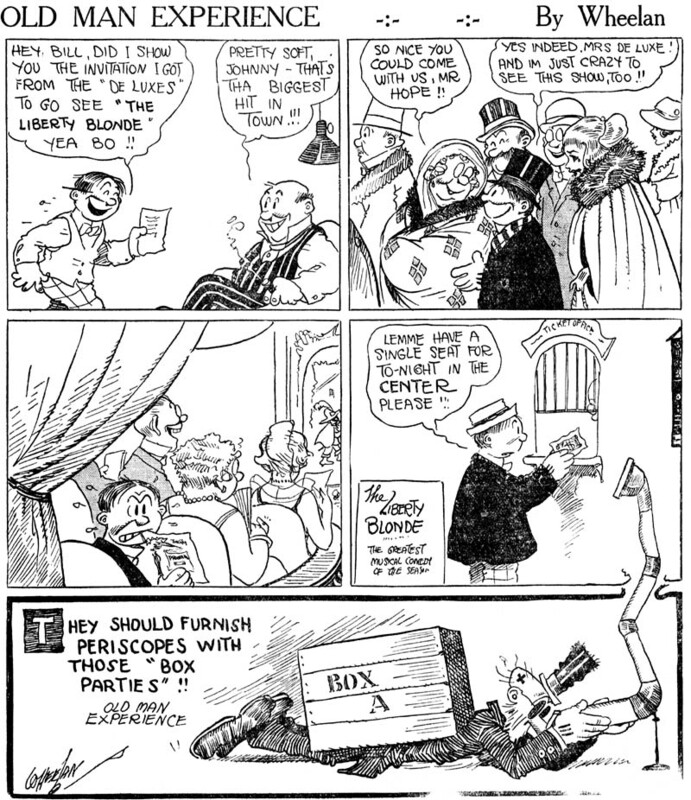 In addition to more strips by Marriner and Lederer, Everrett Lowry had joined the section and was contributing a lot of material. Of greatest interest are his strips that he would continue for other syndicates; Deacon Backslider, which was revived at the Philadelphia Inquirer; and Binnacle Jim (start date 7/19/03), which went on to have a checkered history with McClure and the Inquirer both. Binnacle Jim survived the end of the Chronicle's color section by one week - a final episode was printed in black and white on 10/4. And Lowry wasted no time peddling his wares elsewhere - the strip began appearing in the Philadelphia Inquirer section on 11/22/03. I have ordered the Chicago Chronicle for 1902 with the hopes of finding the beginning of the section - will keep you posted. On the Dem Boys front (see original posts here and here), I ordered the microfilm of the Cleveland Leader, where Alfredo Castelli had found an inconveniently early installment of the strip (I had it starting late in 1915, he had it earlier, with rumors that it started yet earlier in 1914). Well, turns out that the strip started way back on June 28, 1914. Now that date makes absolutely no sense with the World Color Printing section (there was no room for this strip then). But another piece of data turned up at just the same time as I got this info. Turn to page 110 in the new issue of Hogan's Alley (#14) and you will find an ad from the McClure Syndicate in which they advertise, among other strips, Dem Boys. Mystery solved! World Color didn't have to make room for it, because it wasn't theirs. Now the only question still needing an answer is when exactly the strip changed syndicates. We'll keep working on that one. Before we leave the Dem Boys matter, though, I have to pass along something that I found pretty hilarious. The Cleveland Leader put Dem Boys on the front page of their comic section right from the start of the strip in June 1914. The rest of the comic section was all New York World material. If you understand why that's so funny, you are a true blue comic strip history geek. So do you get the joke? One last update. 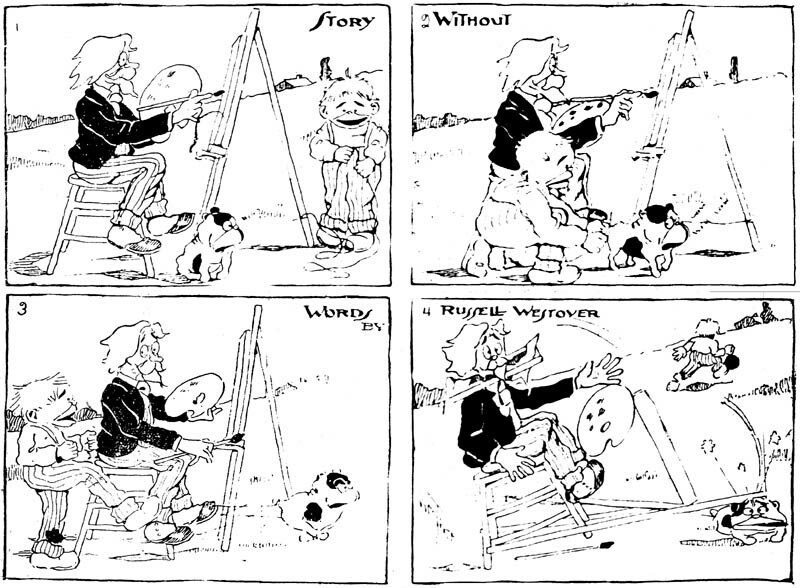 Back in this post I said that I found what might be the first Russ Westover cartoon to appear in a newspaper in a 1903 San Francisco Bulletin. 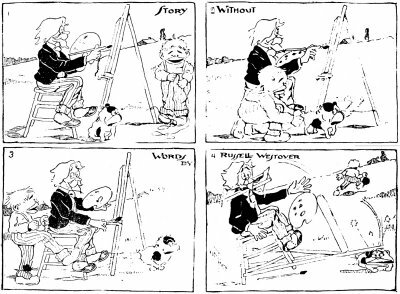 However, on further microfilm research I find that his first seems to be this comic strip that ran in the Bulletin way, way back on April 20, 1902. Sorry about the bad reproduction - for once it's not the microfilm's fault - the printer attached to the microfilm machine was acting up that day. Before his great success with Minute Movies, Ed Wheelan had struck less impressive paydirt with a feature titled Hope And Experience. The feature started on December 10, 1915, and it was Wheelan's first continuing series for Hearst's New York American. Although Wheelan tried out a number of other features in the pages of the American, mostly in 1916, this is the only one that really stuck. The feature, as you can see in the example, featured Mr. Hope and Old Man Experience. Hope was a young optimist who always got the short end of the stick, and Old Man Experience then provided his jaundiced reflections on the state of the world. The feature was renamed to Old Man Experience in 1917, and ended on April 6 1918 as Minute Movies (then Midget Movies) was taking off. Here's a rarity from the Cleveland Leader called Don And Dot In Opera Glass Land. 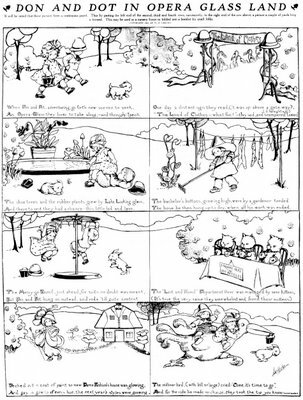 This Sunday strip was written by Louise Hunter and drawn by Lillian Woolsey Hunter. Lillian is apparently known for her glamor girl postcard designs from the 00s. Here's a website that shows a few of her productions. This series in the Leader ran from February 22 to April 19, 1914. Though I only saw four strips in that period, I suspect that the microfilm was missing some sections of the Sunday papers, so it may well have run every week, and also may have lasted longer than the dates I'm citing. The first installment carried a copyright to the Hunters (sister, I'm guessing? ), while the rest of the series was copyrighted to W.P. Leech. Leech may have been an entrepreneur trying to syndicate the feature, the owner or manager of the Leader, or perhaps just another family member. No way to tell based on the little information I've been able to gather. Interesting to me is the art style, which doesn't match that of Hunter's postcard work. It is, however, practically a dead ringer for Rose O'Neill. While many women cartoonists emulated the A-list of their gender (O'Neill, Drayton and Brinkley), rarely have I seen one of the imitators do such an outstanding job of imitation. Click here to see the list of items for sale on eBay. I saved the best for last. 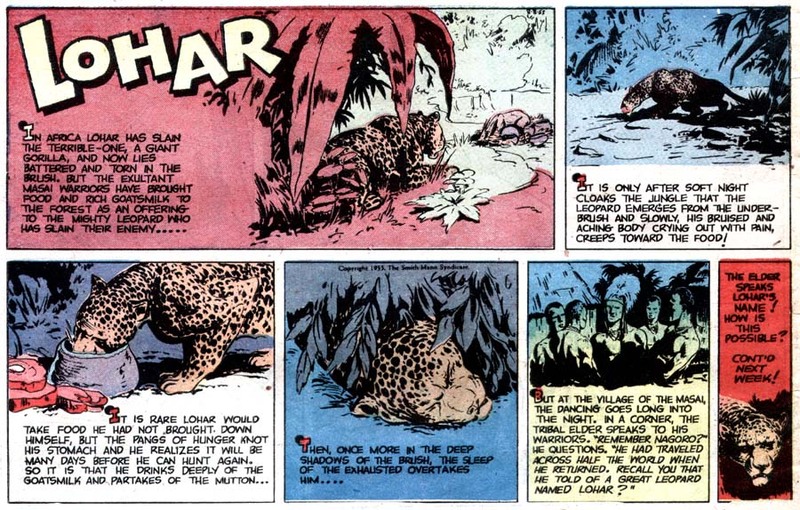 Lohar is the story of a leopard, and it is as well-written and drawn as it is unusual. I can't think of another strip that chronicled, in a serious manner, the life of a wild animal (surely I must be forgetting one?). Yet it seems like such a perfect subject for the comics page. The story of Lohar, credited to Tom Brady, is so interesting that I had to take the time to read quite a bit of the continuity while I was indexing the Courier microfilm. It's a luxury that I seldom allow myself in the rush to get as much indexing done as possible on my research trips. Lohar is a strip that I would love to see reprinted in its entirety - most likely an impossible dream since the source material is so rare, and even the microfilm record is far from complete. Lohar started with the Smith-Mann comic section in 1950, and lasted until October 18, 1958, long after the color section folded. 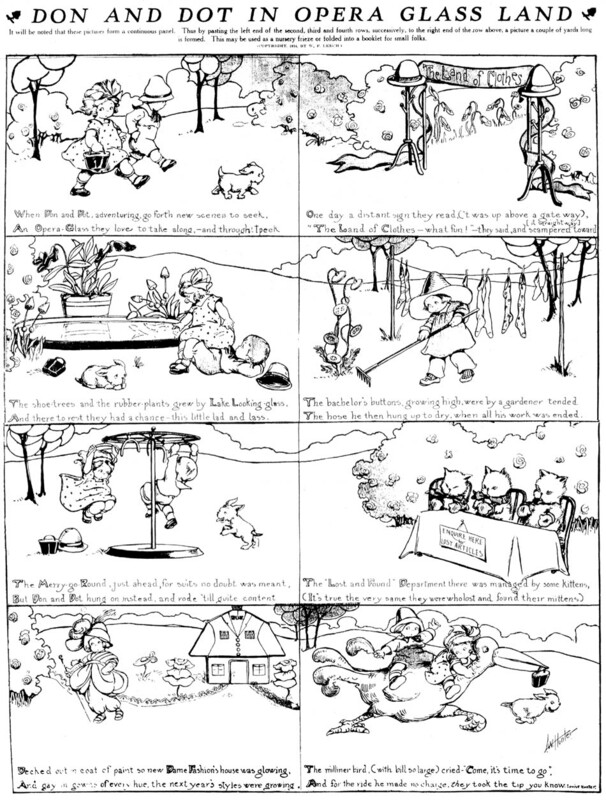 Later strips were copyrighted by Eric Jon Associates -- I have no idea what that is. I have to disagree... all of these strips deserve a reprint book. After having been told there were almost no black comic strip artists, it is shocking to see so many together. Surelu there must be some fund somewhere that would subsidize a reprint/history of these newspaper stips. As for comcis with animals as animals I can remember two.. there was a short run of real life bear stories by Syd Shores in the late forties Timley western books. And more recently there was a comic book series about the life of dinosaurs that was quite good. Hi Ger - seems to me that if you need a grant to subsidize a reprint project then the project perhaps wasn't worth doing anyway. If there's an audience for the material then the profit motive will take care of things. I'm not a fan of government and institutional art subsidies. In our age of disposable income, good art will find a paying audience. Regarding animal comics, I was thinking just in terms of newspaper strips. With comic books it seems like there's few things that haven't been tried at one time or another.